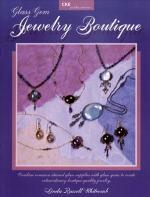 Demonstrates how to make jewelry from glass nuggets and beads. The finished pendants, earrings and bracelets are delicate and beautiful, yet are easy to make. 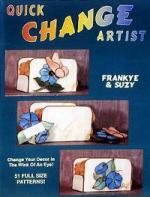 Step-by-step instructions are provided along with color pictures of the finished pieces. Great for beginners to intermediate crafters. 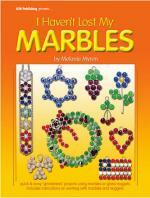 Contains patterns for windows, picture frames, candleholders, decorative stakes and suncatchers. Designs include birdhouses, flowers, a scarecrow, mice, dragonflies, a hot rod, frogs, lighthouse & more. A touch of whimsy is added to each project by using 3-D objects, such as glass bottles, clay pots, etc. 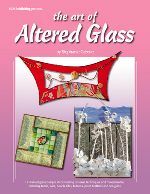 Contains 40 pages of stained glass projects which incorporate unusual items, such as teacups, candy dishes, jewelry and hand mirrors. Each design is shown in full color and includes detailed instructions on fabrication. 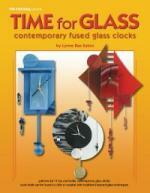 Projects include suncatchers, large windows, plant sticks, earring display frames, mirrors and lamps. Feeling uninspired? Here are 16 inspirational panel patterns just perfect for framing. Designs include a rooster, Happiness in Bamboo, Grape Harvest, bevel cluster panels, a beached sailboat, a bird house, climbing rose, morning glory, apple orchard, jeweled abstract, a star gazer lily, and more! Step-by-step instructions and glass suggestions included. Full color photos. The first of a two-part series developed for the Intermediate Student combines 3-D containers with flat and dimensional decorative work. Full-color photos of each pattern. Mix and match 12 patterns for 5 containers. 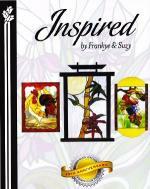 Contains 19 full size patterns for picture frames that are sure to make a lasting memory look even better. Complete instructions and material lists. 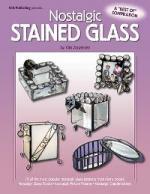 Contains 19 full-size patterns for stained glass photo frames. Styles include 3-D frames, wall-mounted and traditional picture frames. Many of these projects hold more than one photo and the 3 D frames are excellent for an end table or office desk. Complete instructions plus project hints included. A "best of" compilation, this new book features 5 projects each from Jorgensen's previous titles: Nostalgic Glass Boxes, Nostalgic Picture Frames, and Nostalgic Candleholders. The keepsakes you'll create from these patterns feature lots of bevels, decorative wire, and glass nuggets. Instructions for assembling these projects include a unique method of making copper foil flowers and leaves to use as added embellishment. Full-size patterns and color photos of the projects are included. These projects make great gifts... if you can bear to part with them. 34 pages containing 20 different designs to create display cases, picture frames, knick-knack shelf, collage, jewelry boxes and more. Frame your memories in glass and they will last an eternity. Features 51 designs using velcro allowing you to remove one motif and replace it with another. 24 quick and simple projects that easy to make without losing their exquisite look. Make suncatchers, small panels, plant sticks, angels, fairies, rocking horse, and lots more. Detailed instructions and full color photos included. Designs for classy copper foiled necklace medallions and matching earrings. 15 design motifs include Hummingbird, Butterfly, Leaf, Nautilus, Hibiscus and more! Detailed instructions for hanging with beaded chain and wire knitting. Attractive jewelry any woman would love! 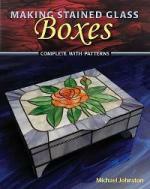 34 patterns for the popular stained glass jewelry box. The design styles include a sailboat, antique car, geometrics, mini ring boxes and a storage box for audio cassettes. The simple assembly steps are fully explained and all boxes are shown in color. Offered are a variety of patterns for decorative fireplace screens. Design themes include autumn, Victorian, Mackintosh, tree of life, garden gate, lily pond, lattice, and beveled traditional. Patterns are presented in 3- and 4-panel frames. Detailed instruction is included. This is a book for intermediate crafters. Stained Glass picture frames in many styles. Shell, Animals, Tree, Great gifts for all. A beautiful mirror can make quite a statement in your home by reflecting light and making your room seem larger. 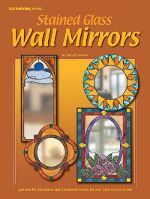 Judy Coleman provides you with many mirror choices (both shape and style) in this new book. There are rectangular, oval and round mirrors with titles such as Sun, Seashell, Sun/Moon, Trellis, Window Box, Castle, and Roses. The Autumn mirror features a cobweb and spider in a tree branch; Flying Geese is based on a traditional quilt pattern; Iron Scroll has a scrollwork border; and Sante Fe is a circular mirror done in a Southwest style. Create a mirror for your entryway, bathroom, family room, bedroom or kitchen. Tips and hints for working with mirror are included here and will help you add something beautiful and new to your decor. Add elegance to the office by creating stained glass business card holders, pencil holders, and desk organizers for paper pads, paper clips, etc. 25 different styles to choose from including sunbursts, moonshadow, and sport themes. This comprehensive book contains a wide range of designs for 30 plant containers. The step-by-step assembly instructions are accompanied by a helpful guide to selecting and caring for plants in terrariums. All projects are photographed in color. Something completely different… a book full of ideas for combining stained glass with "embellishments" of all kinds: fabric, ribbon, paper, paint, beads, wire, ceramic and more. Included are 16 patterns for suncatchers, mirrors, and wall hangings that can be made as shown or used as a starting point for your own ideas.